Conditions: Pandemic Period. Increased and sustained transmission in humans. First human case in North America OR spread throughout United States. The MSDH EOC will upgrade to a Level II or Level I response through the recommendation of the SHO. As deemed appropriate, the Incident Commander may establish support cells for the purpose of coordinating activities assigned by the Incident Commander; all such support cells will coordinate operational information with the MSDH EOC. The ESF 8 Public Information Officer (PIO)/Emergency Communications Officer will initiate communication with local and national counterparts as directed by the Incident Commander. The ESF 8 PIO/Emergency Communications Officer will interface with appropriate counterparts at the national level. Condition: Recovery and preparation for subsequent waves. The MSDH EOC will convene with the State Epidemiologist and other appropriate stakeholders to assess criteria for potential cessation of enhanced public health support and generate a demobilization plan to describe staged withdrawal of enhanced public health support. The Planning/Intelligence Section will submit an After Action Report (AAR) and revise the Plan as appropriate for subsequent waves. o The MSDH SNS Plan. Depending on availability of vaccine, antivirals, and medical countermeasures, RSS Team will be placed on Active Status. Depending on availability of product, PODs will be activated for administration of pre-pandemic strain vaccine. The POD Operations Manager will report operational information routinely to Operations Section. The MSDH EOC and the State EOC will coordinate response with neighboring states and Mississippi tribes. 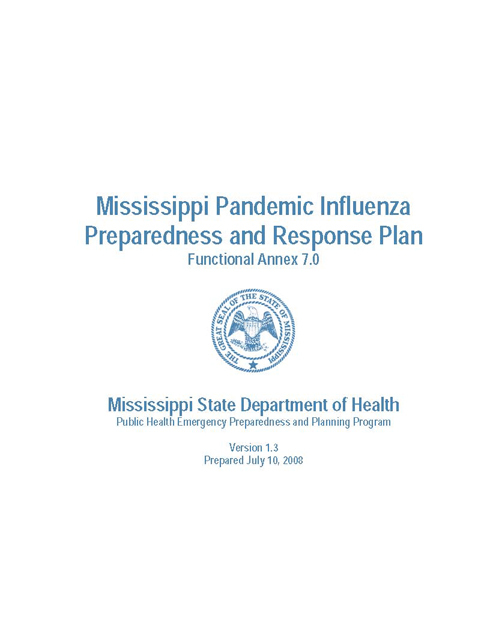 The purpose of this Section is to describe preparedness efforts and response actions in providing State assistance and coordinating local resources in modalities for mitigating transmission of PI; present the Federal concept of a pandemic severity index; set forth Federal parameters for early, targeted, layered use of non-pharmaceutical interventions; provide MSDH consensus statements on isolation and treatment of ill persons, and quarantine of household contacts of ill individuals; proffer guidance for dismissal of schools and closure of child care programs; and, engage in polices regarding community social distancing. As there is no pharmaceutical or other therapeutic intervention which constitutes a cure for PI (or any influenza, for that matter), medical strategy emphasizes the course of prevention, by immunization, and secondarily pursues control by timely initiation of neuraminidase-inhibiting antiviral compounds, by fastidious respiratory hygiene and personal protection, and by other nonpharmaceutical methods. Vaccine against a novel influenza strain will be unavailable initially and when it becomes available (based on conventional manufacturing technology and capability—at least four months into the pandemic), supplies will be very limited. Adequate supplies and efficacy against the novel viral strain of neuraminidase inhibitors antivirals have NOT been established. In view of the situation with both vaccine and antiviral agents, mitigation of PI, particularly during the first wave (first 120 days)—on both the community and individual level—will depend heavily, if not exclusively, on non-pharmaceutical measures. United States Code (42): 264, 243, and 5121 (Stafford Act) accords the Secretary of HHS/CDC the authority to apprehend and detain international or interstate travelers “reasonably” believed to represent a communicable disease threat to others, to assist states and local governments in the implementation and enforcement of isolation and quarantine, and in a state of emergency, to bypass state and local government in the direct implementation of isolation and quarantine, respectively. Executive Order by President George W. Bush, on April 1, 2005, includes novel or reemergent influenza among the list of communicable diseases for which quarantine may be appropriate.